I try and get out into the local lanes on my bike regularly, though trips away and other writing jobs means that I end up cycling elsewhere and not managing to get out enough in my local area. Then typically, when I do so the forecast is for rain, and I find myself having to hurry to get back before the deluge arrives. 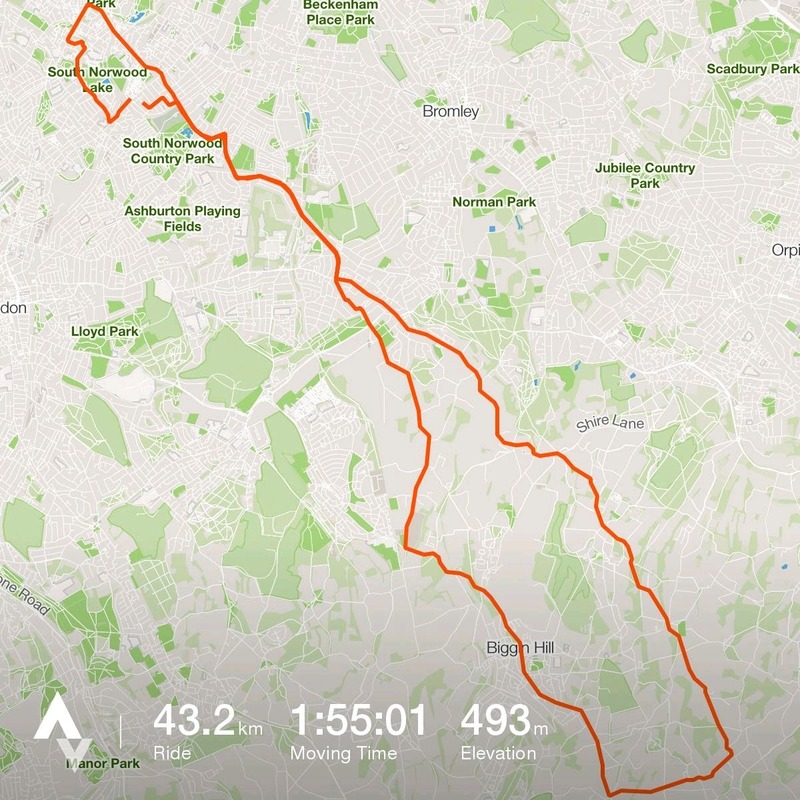 Or if the weather is not rainy, the roads are damp, so it means when I have to ride over those infamously steep hills of the North Downs I have to ride the 20% gradients in the saddle, as the back-wheel spin from an out-of-the-saddle effort unnerves me a bit. Today was one of those nice sunny days where there was wall-to-wall sunshine, and everyone in South London was out. I couldn't stop waving and saying hello to folks. A big group of guys from my club, Penge Cycling Club was out. I didn't join the ride as I couldn't quite make the start, and also I had a specific route that I wanted to do, and needed to be back in time to compete in the Southern Road Relays that afternoon. But I gave a hello to them, and hope to be out on a ride quite soon. 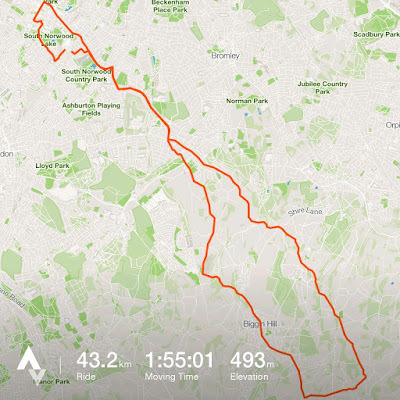 This route is one that I call my quick Kentish Spin. It's not long, but it is still a good work-out as it includes the long drag up Layhams Lane, a short, sharp, steep ramp up Saltbox Hill, and another short, sharp, steep ramp up Cudham Lane. Then you can breeze home via Downe (aka Nigel Farage's hangout) and Keston before returning home. Although this ride goes about 12 miles out of London, and is within the M25 London orbital motorway, it still feels very much like you are in the countryside. I find it amusing how people from other parts of the UK often ask how I could possibly find anywhere to ride when living down in London. Surely, it must be nicer to live in Yorkshire or Cheshire than in London if I want to get in nice quiet country lanes? Well the answer is, not really! It's not that difficult to find country lanes, or even steep hills from where I live. They are all there, within half an hour of me leaving the house, and that's one of the great things about riding these roads - their proximity as well as their natural beauty. Of course, cycling in Cheshire and in Yorkshire is lovely too. But it's a bit of an ask to get a train all the way up there every Sunday morning!